Gunmen kill an Egyptian policeman who was on a security team guarding the home of a judge in the trial of ousted president. Gunmen on Friday killed an Egyptian policeman who was on a security team guarding the home of a judge in the jailbreak trial of ousted president Mohammed Morsi, security officials told AFP. Attacks on Egypt’s security forces have surged since the army ousted the Islamist Morsi last July, and as the military-installed authorities press a deadly crackdown on his supporters. Sergeant Abdallah Metwally was shot dead as he rode his motorbike across a bridge over the Nile in the city of Mansoura north of Cairo, according to AFP. The attack on Metwally, who was wearing plain clothes, was carried out by assailants who were also on a motorbike, at about 7:30 a.m. local time, Brigadier General El-Saeed Omara of Mansoura police told the news agency. His killing comes with an appeal court on Saturday set to examine a defense request to appoint a new panel of judges in Morsi's jailbreak trial. 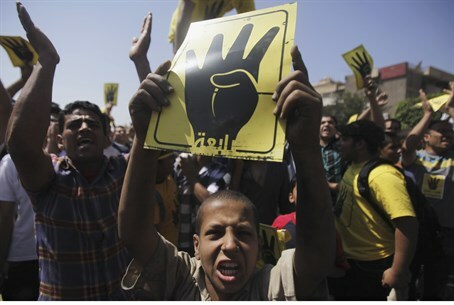 Morsi and 130 other defendants, including Palestinian Arab and Lebanese militants, are charged with organizing jailbreaks and attacking police stations during the 2011 revolt against former President Hosni Mubarak. The case, one of three already opened against Morsi, is part of a relentless government crackdown targeting him and his Muslim Brotherhood movement since his ouster. Earlier this week, prosecutors in one of Morsi’s trials accused the deposed president of leaking state secrets to Iran's Revolutionary Guards as part of a plot to destabilize Egypt. Mansoura, in the Nile Delta, where Friday’s killing took place, was the site of a deadly car bombing in December when the city's police headquarters was attacked, killing 15 people, mostly policemen. That bombing resulted in the Brotherhood being designated as a terrorist organization by the army-led government. The Mansoura bombing was the deadliest since Morsi's overthrow outside the Sinai Peninsula, where terrorists have killed scores of police and soldiers. While most of the attacks have been claimed by the Al-Qaeda inspire Ansar Bayt al-Maqdis, interim Egyptian authorities have long claimed a link between the Brotherhood and the string of bloody attacks that followed Morsi’s ouster. The Brotherhood, for its part, has denied any connection to terrorism in Egypt.